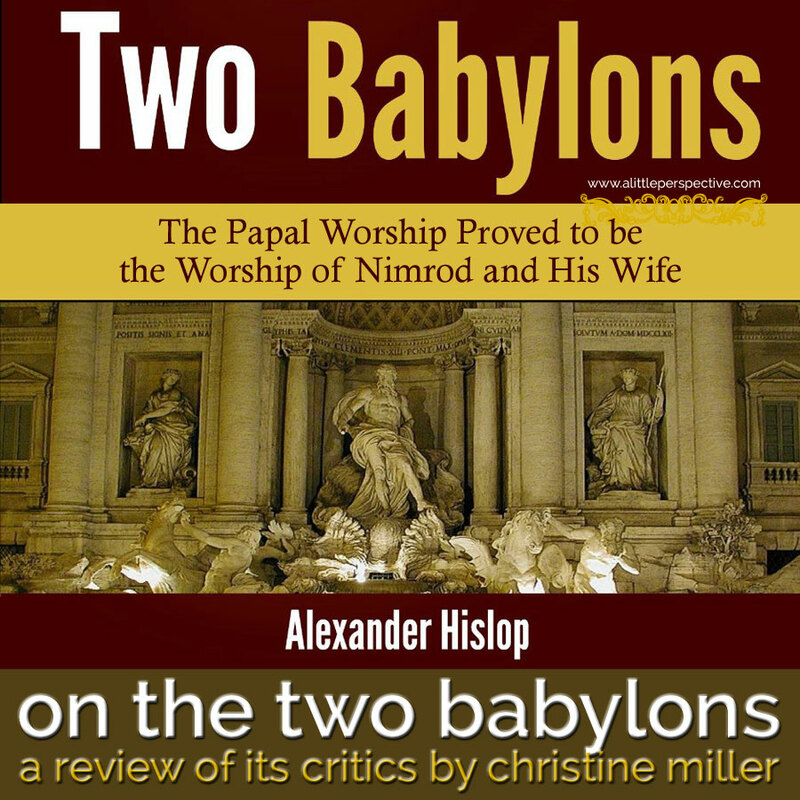 Last week I mentioned a book by Alexander Hislop, The Two Babylons, as a recommended book to read to learn biblical history, specifically, how Nimrod’s rebellion at Babel established paganism throughout the world, and how various aspects of that paganism carry on in our society today. The question was asked about a book by Ralph Woodrow, The Babylon Connection? which is supposed to debunk Hislop, and my opinion on the matter. Here it is. I have Woodrow’s book, and frankly, I did not find his evidence against Hislop convincing or authoritative. In my opinion, he did not, in that book, bring forth proofs which invalidated Hislop’s research. He instead questioned Hislop’s conclusions without showing that Hislop’s facts or conclusions were false. That does not constitute proof of falsity. Here is another critique of Hislop’s book from a website which is much more careful in showing evidence of their statements. (When I was updating the links in this post in February 2014, I discovered the link to the critique was broken, and a search for the article did not turn it up. It was live at www.tektonics.org/guest/hislop01.html when this post was published). In this critique, the author gives three examples of errors of fact in Hislop’s work, all of which have to do with the second part of Hislop’s book, which is to show that Babylonian paganism infected the Roman Catholic Church. I concur with the author of this critique that these are in fact errors on Hislop’s part; and of the three examples cited, none concern the footnotes and documentation which abound in the first part of Hislop’s work. The first part of the work all has to do with showing the connection of Nimrod and Babylon to paganism as it has spread around the globe. But in any critique, the author takes the most egregious errors of fact and exposes them to make his point solid and secure. The three examples cited are relatively minor compared with the entire content of Hislop’s work, and in fact does not address the most important connections Hislop draws, with authority, between Babylonianism and paganism and its traditions which still abound in our society today. I can only conclude that those connections are not exposed because they cannot be exposed; they are irrefutable. And I just have to take exception with the author’s 2nd stated reason why he cannot recommend Hislop: “Outdated scholarly sources and the fact that The Two Babylons was written well over 100 years ago.” The date of sources do not disqualify their facts, nor does the date of Hislop’s authorship — otherwise atheists can tell us that the Bible is an unreliable source since it was written thousands of years ago! (And some of them do say this, but age does not invalidate truth or facts.) I was frankly surprised to read this on a website of this caliber. But if anyone has evidence of the error of Hislop’s main scholarship, especially in regard to the Nimrod and Babylonian connection to paganism, other than the two I have already discussed (the only two I could find, by the way) please let me know — I am always learning and would appreciate a chance to study this subject further. In fact, I read Hislop’s work last after reading numerous other works of even greater antiquity, all of which confirmed Hislop’s facts, especially in the first part of the book, the part dealing with the Babylonian connection to paganism. Those resources include Josephus, George Rawlinson’s Five Great Monarchies of the Ancient Eastern World, Jacob Bryant’s Ancient Mythology, and others. This is why, when I read Hislop, his statements concerning Nimrod and Babylon did not surprise me, having encountered evidence for them in the numerous other works I had read in preparation for Story of the Ancient World. Hislop footnotes and documents his information extensively from classical (Greek and Latin) sources, which were independently verified by Edward Joshua Cooper of Markree Castle, Ireland, who passed away in 1863, ten years after the first edition of Hislop’s book was published. Cooper was a distinguished scholar and astronomer, the author of his own works on astronomy, a fellow of the Royal Society, of the Royal Astronomical Society, and a member of the Royal Irish Academy, as well as a member of Parliament for many years. He was a sincere Christian who, in his private time, personally examined 260 works cited in Hislop’s footnotes in the original Greek and Latin and confirmed their accuracy. Back in December of 2006, I asked that if Hislop’s assertion that Christmas is a tradition which has been received from the Roman Catholic Church, and has been infected with Babylonian paganism, is false, then why did the Puritans who emigrated to America in 1620 forbid the keeping of Christmas as a pagan festival 200 years before Hislop was born? No one has answered this question yet, to my knowledge. Anyone wishing to examine the Babylon connection which exists between Nimrod and paganism, can follow the series I am blogging beginning with this post, incidentally using none of Hislop’s work as a source, since there is a dispute over him. But by the end of the series, we will see how much of Hislop’s research has been verified. As a family who has been learning and studying more and more Biblical history, the Christmas issue has become a doozy! You can imagine. I'm curious and hoping to hear your opinion, since you seem to believe this–if Christmas is essential "pagan" practice, do you celebrate it at all? If so what do you do or not do? Do you celebrate alternatively? Hearing from another mom on this would be encouraging. I know these are biggies, but I'd love to know how you have solved these questions. Some friends of ours won't even use the word "Christmas" and won't respond to "Merry Christmas" for anything. Though the evidence seems pretty straightforward, the issue is emotionally confusing and intimidating. I am sure that I am not the only one who appreciates you taking the time to share your opinion on this matter. Thanks! I, too, wanted to add my thanks for your research. I actually read the Hislop book a long time ago, and still have it. It is quite enlightening.